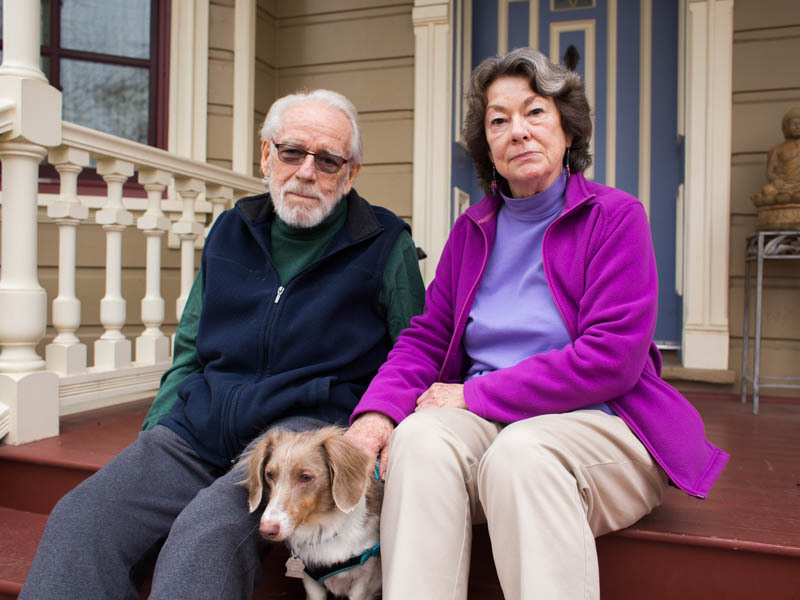 Neil W. MacLean and Sue Carrey sit with their dog, Wally, at their Sacramento home. Neil W. MacLean and Sue Carey have built a quiet, simple life in their Sacramento home. The sitting room is lined with books, the coffee table covered in magazines and newspapers. Their long-haired dachshund Wally dozes to the ticking of a grandfather clock. MacLean is 83, and he’s been cautiously optimistic since receiving an Alzheimer’s diagnosis two years ago. He’s in the early stages, and he can still mostly keep track of his medications — with a little help from Carey. 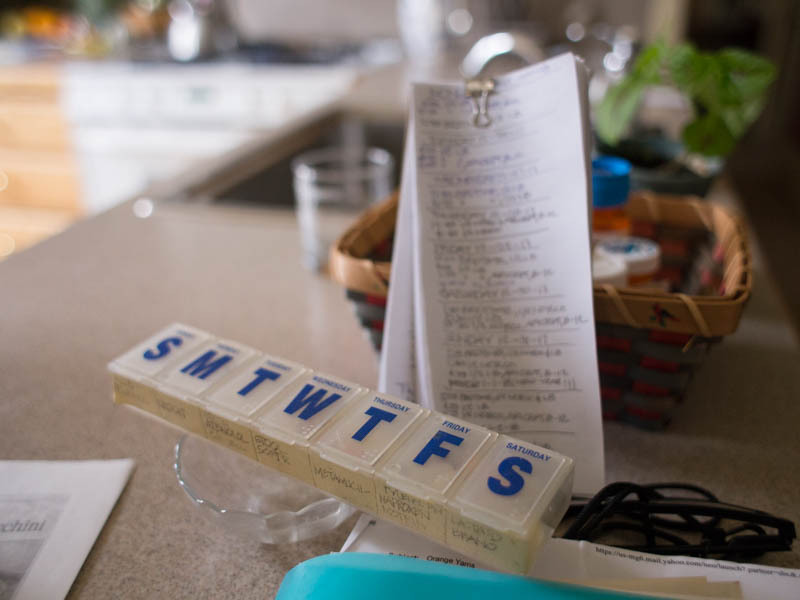 Every Sunday, Carey sorts MacLean’s five prescriptions and assorted vitamin supplements into a pill organizer. He takes the pills and writes down what he took. Carey double checks to make sure he swallowed everything. Sometimes, though, MacLean forgets to log the pills. It’s the sort of patient error that doctors and pharmacists are worried about. About 125,000 people die annually because they took their medications incorrectly, and the problem costs the healthcare system more than $100 billion a year, according to an analysis from health research institute IQVIA. Dr. Dean Schillinger, a primary care doctor at Zuckerberg San Francisco General Hospital and a professor of medicine at UC San Francisco, said there are a lot of reasons behind what experts call “medication nonadherence.” Some patients feel the cost of their medication is too high, or they don’t understand why they have to take it. Others have trouble reading the labels or doing the math on dosage. He said there’s often a breakdown in communication between doctors and patients, or patients and pharmacists. Technology is rapidly emerging as a possible solution. At least 50 health care companies focused exclusively on helping people take their medications have popped up in the last few years — six of them in California, according to startup site AngelList. Some pharmacies recently started selling prescription vials with countdowns on the cap that tell patients how long it’s been since they last popped the top. The vial can also send email or text reminders and create medication reports. This fall, the U.S. Food and Drug Administration made headlines for approving the first “digital pill.” The medication, intended for schizophrenia, is embedded with a special sensor connected to a patch on the stomach. When the pill hits the stomach, the patch alerts a mobile app that the dose was ingested. These innovations tend to be expensive, and they’re not well known to the average patient. But Dan Gebremedhin, a principal at a healthcare-focused venture capital firm in Boston, said he expects they’ll have a growing presence on the market. BJRX Pharmacy in Stockton is trying something new to help patients stick to their medications. This fall, they installed a pill-dispensing robot from a company called Omnicell. It looks a bit like a vending machine. A pharmacy employee can feed a patient’s prescription regimen into the machine, and the machine produces a day-by-day packet with up to four dose times for each day. The machine sorts through all the patient’s medications and distributes exactly what’s needed into each of the packet’s dose compartments. The compartments are tear-off, so patients can travel with a week’s worth of doses or even just a few hours. Schillinger of UCSF said there are other innovations that could be implemented on the pharmacy level, such as standardized, easy-to-read labels for prescription bottles and more accommodation for people who don’t read English. But he said the lack of collaboration between pharmacies, hospitals and physicians has historically hindered efforts to improve medication adherence on a large scale. Neil MacLean said that, if he eventually can’t remember to take his medications on his own, he’ll rely more heavily on his partner, Sue Carey, to guide him. He’s still in the early stages of the disease, so he can do a lot for himself. He said he still remembers most of his career as an architect, his childhood in Brooklyn and the last 40 years with Carey. He also remembers what happened to his father — also a victim of the degenerative brain disease that slowly chips away at cognitive function. The Alzheimer’s Association has a tip sheet on taking medications. They also give free advice through the Alzheimer's Association 24-7 helpline at (800) 272-3900.